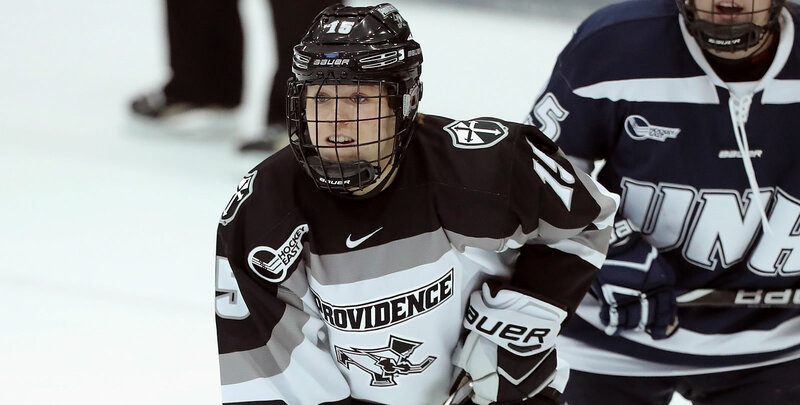 PROVIDENCE, R.I. - The Providence College women's hockey team defeated the Bemidji State Beavers by a score of 4-3 on Saturday, Oct. 6 at Schneider Arena. Maureen Murphy (Buffalo, N.Y.) scored two unassisted goals in the win. Schneider Arena | Providence, R.I.
- Providence's best chance of the first period came with less than a minute on the clock. Emily Landry (Orangeville, Ontario) and Hayley Lunny (Bedford, N.Y.) skated in on a 2-on-1. Landry slipped a pass to Lunny, who rang a shot off the crossbar. - Claire DeGeorge got Bemidji State on the board with her first goal of the season at the 3:24 mark of the second period. She was assisted by Emily Bergland and Briana Jorde. - Just 1:03 later, Lindsey Featherstone got the Beavers' second goal of the game. Her first of the season was assisted by Ellie Moser. - At the 9:43 mark of the middle stanza, Tina Kampa found the back of the net for BSU. Abby Halluska drew the face-off back to the blue line where Kampa blasted a shot that beat Sandra Abstreiter (Freising, Germany). - Providence began the comeback with a goal from Sara Hjalmarsson 11:25 into the period. She used the defender as a screen and beat Lauren Bench over the shoulder. The goal was assisted by Avery Fransoo (North Battleford, Saskatchewan) and was the first of Hjalmarsson's career. - Maureen Murphy (Buffalo, N.Y.) cut the deficit to 3-2 on an unassisted goal with less than two minutes remaining in the period. She stole the puck in the neutral zone, skated in on a breakaway and beat Bench with a wrist shot, blocker side. - 7:25 into the third period, Murphy tied the game with an extremely similar goal. She once again stole the puck, skated in on a partial breakaway and beat Bench. This time, her goal was both unassisted and short-handed. - Neve Van Pelt (Mitchell, Ontario) scored the game-winner with less than 10 minutes remaining in regulation. Her first goal of the season was assisted by Landry and Whitney Dove (Port Moody, British Columbia). - Abstreiter made her first career start in net for the Friars. She made 14 total saves and allowed three goals. - The Friars completed the weekend sweep of Bemidji State with today's win and moved to 2-0-0 on the season. The Friars begin league play next weekend, hosting Holy Cross on Friday, Oct. 12. Puck drop is set for 6:00 p.m. at Schneider Arena.